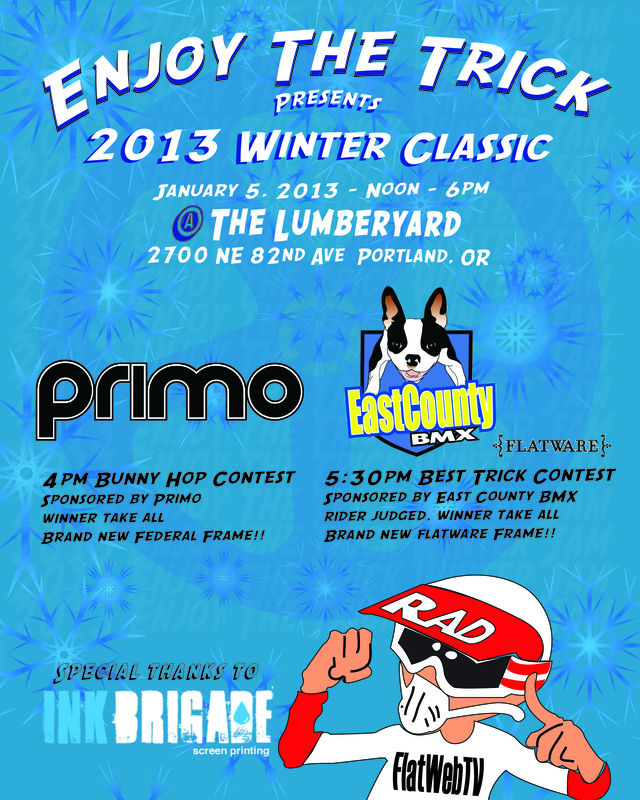 2013 Enjoy The Trick Winter Classic – Date/Location Set! We’re back! And not a moment too soon. The first bit of good news is that the 2013 Enjoy The Trick Winter Classic is on, and it’s indoors! The Northwest’s premier indoor bike park, Portland’s own Lumberyard, will host the jam in their downstairs riding area. Full restaurant and bar upstairs, plus the park?! Can’t ask for a better location. The next bit of good news is that two brand new frames will be given away. Highest bunnyhop wins a brand new Federal frame courtesy of Primo. East County BMX will be sponsoring the best trick contest. Rider judged and winner take all (a brand new Flatware frame!). Start making your arrangements to get to Portland on January 5. Is there a better way to ring in the new year than to possibly win a new frame? We think not!